From the air as my plane descends into San Pedro Sula — the industrial capital of Honduras — the economy of the country appears to remain largely in the hands of large corporate fruit companies. Indeed, I had read that Standard Fruit (Dole) continues to have an important presence in Honduras. Below me are endless acres of pineapple, banana, and papaya fields. As far as the eye can see. San Pedro Sula, disappointingly, contains mile after mile of strip commercial development. Dominoes Pizza, Burger King, Pizza Hut, Sunoco, Kentucky Fried Chicken, and Popeye’s makes it immediately apparent that Honduras has not escaped this form of cultural and economic imperialism that the United States has spread throughout the globe. Our bus ride to the Aggressor SCUBA dive boat we will live on for the next six days provides us with over three hours of travel through the Honduran countryside. We spot a great many men wearing what I presume are traditional cowboy hats. A number of horse-drawn carts along the (surprisingly) paved highway we are on tell us that the old is still mixing with the new, at least with regard to transportation. The ambience and character of the countryside we see is quite similar to Belize, which of course is not surprising since Belize is a neighbor of Honduras. A great many cattle and horses grazing along the roadside right-of-way, and quite a few chickens, which conveys a third-world, lower-income message. The bus also drives over quite a few river bridges, which is to be expected given the impressive mountain range on one side of our highway. Most homes, like in Belize, are of cinder-block construction. Much of the Honduran countryside is planted with African Palm, which I am told the country now grows in great numbers as a way to create bio-diesel fuel. Our bus ride gives us a taste of what appears to be a contrasting highway driving method in Honduras compared to what I’ve experienced in America. Here in this Central American nation, highway motorists appear to have a rather caviler attitude toward passing slower cars on two-lane roads. Little heed seems to be given to a car approaching from the opposing direction when a Honduran decides to pass. It appears to be accepted that the opposing car will simply be obligated to drive onto the shoulder to give way to the passing car. This is done rather calmly. Indeed, on the bus trip back a week later, slow holiday traffic meant that large herds of cars were passing in such a way. Never in my life have I seen bumper-to-bumper traffic at a standstill sitting in the opposing lane while trying to pass. Noteworthy as well is the relatively large amounts of litter and rubbish that lie along the roadside shoulders. My speculation is that there is little garbage collection and landfilling in Honduras, and that the roadsides have therefore become a common place to dispose of household trash. I should point out that despite some of these unfortunate conditions, Honduras will almost surely be better able to survive a future world of, say, peak oil, than a nation such as the United States, as fuel and proximity to the fruits of the land seem to be more at hand to the population than in the US, where so many are so dependent on imports and assistance from those outside the community. We spend our first night sleeping in our cabin “staterooms” on the docked Aggressor. Very early the next morning, the Aggressor steams to our first day dive destination. We anchor and plunge into our first two dives at Toon Town, which features large, cartoonish, bulbous coral clusters. Visibility here is about 50 feet. The reefs found in Honduras, we are told, are the second largest reef system in the world. Only the Great Barrier Reef in Australia is larger. Our third dive is at a place called Pelican Point (Wall?). With a moderate current, this is a drift dive for us, where the current does the work of moving us along the colorful coral — coral that seems to be a fireworks display. Here, we find out-of-this-world vibrancy of colors — blues, purples, yellows, and oranges. Finally, we anchor at Angel Harbor. This dive site turns out to be relatively confusing, with several coral heads creating a hard-to-follow maze. I would recommend that divers follow a dive master for this dive site. First thing Monday, “Captain Eddy” has the Aggressor heading out at 6 am. 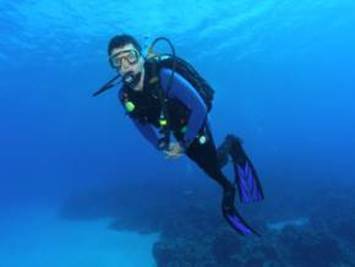 With the welcome sight of a calm sea lying down flat, he guides the boat to the Coco Seamount site — a location that is usually unavailable for diving because it requires flat seas. We are able to do two dives here. And the visibility is excellent — over 100 feet. We spot barracuda, and a school of what appears to be silver spadefish. The school is unfazed by me, and they seem to be unbothered by my swimming into their school to snuggle up to them as we swim together. We also notice schools of yellowtails, triggerfish, and parrotfish amongst the healthy reefs found in this location on the mount. In one of the dives here, I start my descent and look to the bottom, where I spot a brightly-colored divers weight belt. “Does that diver know he or she has dropped their weight belt,” I wonder? Then I notice I’m having trouble descending. To my horror and embarrassment, I reach down and realize that the belt is MINE! I struggle to the bottom, and my dive buddy generously gets to it first to hand to me. Unfortunately, doing so is exhausting and I burn a fair amount of air to retrieve my buoyancy equalizing gear. Water temperature for most of our dives this week is a comfortable 82 degrees. Taviona’s Wall at Roatan features eye-popping visibility ranging up to 120 feet. Not only is the visibility astonishing here, but gliding through the site adds to the exhilaration because here, one is able to find a great many extremely pleasurably narrow swim-through canyons graced with healthy coral. Later, I decide to try a night dive at this site to have one more taste of its joys. Divers know, as well, that night dives benefit from the “they only come out at night” principle, in which the coral reefs are a vastly different world with creatures that prefer being active only after dark. Sure enough, I find an incredible number of large crab within the barrel sponges here. My LED dive light also discovers a great number of sea tiger tail cucumber on the ocean floor. I additionally spot a gorgeous, fire-engine red shrimp within a coral crevasse. Other creatures I come across on this night and during the various day dives in the Bay Islands include Caribbean Spiny Lobster, Giant Hermit Crab, White-Speckled Hermit Crab, Sand Dollars, Bulb Tunicate coral, Green Tube Tunicate, Donkey Dung Sea Cucumber. Curiously, given the health of the reefs we find, there are very few eel, barracuda, turtles, sharks or rays in the Honduran reefs compared to other Caribbean dives I’ve experienced. Our first dive with the Tuesday morning sunrise is the famous El Aguila wreck (see photo above). We descend to the wreck and are IMMEDIATELY greeted by an anxious horde of very hungry giant grouper. “WHERE HAVE YOU BEEN? ?,” they cry. “WE’RE STARVING!! !” These are fish that are spoiled by the feedings they enjoy from various diver groups visiting the wreck. I hold up my hands to one particularly large black grouper to show him I am empty-handed. He swims alongside me for quite a ways, in case I’m trying to trick him. He curls and brushes his body against my arm in a cat-like way. 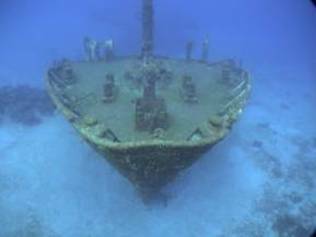 The Aguila wreck sits at 110 feet and is 200 feet long. I notice that a large collection of garden eel are poking their heads out of the sandy ocean bottom near the wreck. I enjoy two leisurely, pleasant swim-throughs on the conning tower stern. Swimming to the bow, I’m greeted by an even LARGER grouper. He is so anxious to see me that he is happy to let me pet him. At the bow, an enormously excited and animated green moray eel is happily eating his breakfast from the dive master fish bucket. The dive master hands me his video camera so I can get footage of this marine feeding. For our second dive, my buddy and I return to the wreck because I want to check out the swim-through at the bow of the ship. Having done that, we head for the nearby (and imposing) coral reef wall. Visibility is about 80 feet. The reefs just off the wreck are spectacular. Healthy coral, fabulous swim-throughs, and colorful tropical fish in what amounts to an underwater slot canyon. I have all kinds of kid-like fun swimming through tall, narrow walls of colorful reef. Throughout my playful, wide-eyed explorations, my grouper friend, of course, follows along just in case its lunchtime. The third dive of the day is at Half Moon Bay. Big, narrow, numerous swim-through crevasses (just the way I like them) are found here, as well as a strong current and surge. So strong that I find I am often not making any forward progress at all despite strong split-fin kicking. On Wednesday, we steam 3.5 hours to Utila. Our first two dives are at “Old House” on the north side of Utila. Here, one finds very steeply dropping walls, and fun swim-through canyons and tunnels. The reefs, as was the case in our previous days, are active, diverse, and home to colorful schools of tropical fish. 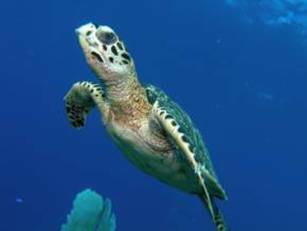 Here we enjoy spotting marlin, hawksbill turtle (see photo above), banded coral shrimp, and scorpion fish well camouflaged in the coral. Later, with the Aggressor heading to our afternoon dive site, I’m reading and dozing in my cabin. Suddenly, there is great commotion and shouting above. The holy grail for divers. 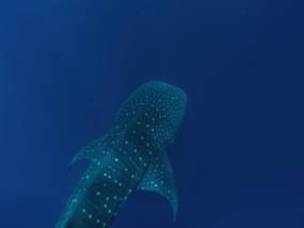 A whale shark encounter is an extremely rare and much-sought-after diver experience. The whale shark (Rhincodon typus), is largest living fish species in the world. The species is believed to have originated about 60 million years ago. The largest documented whale shark is 41 feet and over 47,000 pounds, but there are undocumented reports of this fish being over 50 feet in length. Despite its intimidating size, the whale shark is harmless animal, however, as they only eat plankton. In many ways, they remind me of the Florida manatee. The whale shark mouth can be up to five feet wide and can contain up to 300 rows of tiny teeth. It has five large pairs of gills. The boat storms ahead, looking for the telltale sign of a roiling boil of seawater at the surface, indicating small schools of fish swarming around The Big Guy. We assemble at the back of the boat, anxiously waiting for the signal. I leap into the fairly rough seas, desperate to witness the awesome fish. Then, in the distance ahead of me, I see it. The telltale tailfin and dark brown body with white spots. But the glimpse is fleeting. The creature quickly disappears into the murky blue-gray water. At least I can say that I saw it while in the water. But then I realize how disappointing that would be. My chance of a lifetime is a brief glimpse. How little did I know at the time how wrong I was. There would be more. Much more. The boat dinghy the Aggressor has dragged during our week-long excursions now is plucking us out of the water. The boat speeds ahead in search of Him. Suddenly, a few feet below me, I spot him. He is gloriously swimming just below me at a speed that is slow enough for me to easily remain above him for a few triumphant minutes (see photo above). I am close enough to be awed by his 15 feet of length, dwarfing me above him. I feel like a lamprey fish. He swims very gracefully and unconcerned. He is docile an approachable. Intimidating in size, but gentle in behavior. He vanishes again into the deep. I’m back on the Aggressor. “WHALE SHARK DEAD AHEAD!! !” I wait for the signal and bound back in. My mask falls off from the impact with the water. The spotter shouts “HE IS RIGHT THERE!! !” Frantically, I lunge for my mask, somehow finding it. I throw it on just in time to see The Big Guy glide three feet below me. I am only a few feet from the monster fish. He is directly in front of me heading right at me. We are face to face, only 18 inches apart. Suddenly, just before his enormous head collides into my face, he elegantly turns away. Close enough that his body nearly wraps around me. I reach out and slide my hand along his huge tailfin. The whale shark, I find, has a canvass-like skin. The Aggressor steams on. We spot two more whale sharks cruising near our boat. We have come across a HERD of them. That afternoon, after all the excitement, we dive Jack Neal Point on the south side of Utila. Legend has it that Jack was a pirate who hid buried treasure here. We didn’t find it, but we did spot a scorpion fish and a winged sand diver. As I silently glide over the colorful hills, valleys and canyons of coral reef, I feel as if I am an eagle soaring over my territory in search of prey. But the exploding profusion of playful tropical fish below me is oblivious to my presence as I swim through this gigantic underwater jungle aquarium. Overnight, the Aggressor anchors in a Utila harbor. An armed guard is brought on board to spend the night with us, as modern-day pirates are known to raid dive boats anchored off the harbor town at night. We awake to a sea that looks like glass. The ocean is lying down flat like a pancake. Our first dive on this calm day is Black Hills Seamount on the west side of Utila. Nice coral, a healthy population of fish, and above-average visibility. We encounter a school of Atlantic Spadefish. As the Aggressor moves to our second dive site of the day, I again notice a regular occurrence: Large schools of flying fish fly up to 50 or 100 yards just above the waters’ surface as the fish flee the on-coming boat. This second dive is at Cannery Bank on the eastern side of Utila. Reefs are very healthy on this rarely visited reef. We see big schools of creole wrasse, amongst giant forests of barrel sponge and brain coral. The Pinnacle and Fish Bowl is our third dive of the day, and here we enjoy diving with a graceful Giant Manta Ray, a chomping spotted eel, and a wriggling green moray. Blackfish Point on the north side of Utila is our fourth dive. It is a night dive. The dive starts, thrillingly, by my entering a sea cave. It is one way in and one way out. I penetrate deeply and come to the end wall – a sort of “T” intersection inside the cave. The walls are very geometrically sharp and straight-lined, suggesting the cave has somehow been built by humans — which it wasn’t. Later, we spot a large moray and a menacing barracuda (barracuda are much scarier and intimidating at night, by the way). Larger fish, interestingly, seem to be nestled into little fish nests on the sandy bottom. Their way of sleeping? Friday morning finds us at Ted’s Point. More stunning slot canyon swim-through’s with steep walls and sugar-white sand bottoms. In the early portion of our dive, we inspect the small Rojan’s Wreck. Our second dive is also here, and I am amused to notice a large fish swims alongside of me the entire way. Clearly, he is expecting me to be his meal ticket. But I’m now wise to this. Here we find enormous fields of what looks to me like brown coral lettuce. 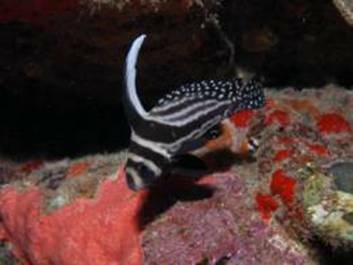 I spot a number of healthy-looking lobster, a gorgeous and graceful spotted drum (see photo above). The reefs, again, appear pristine. After this Friday morning diving, the Aggressor docks and I spend the afternoon strolling Main Street in Eastern Harbor, Utila. The town is very similar to the tropical ambience one finds in coastal Belize, Bonaire, and the Florida Keys. Very laid back. Everyone seems to be either a beach bum, a tourist, or somehow a part of the dive industry. The town, of course, is chock full of dive shops, Tiki bars, scooters, bicycles, motorcycles, and ATVs. One and all seem to speak a mix of Spanish and English in every sentence. Off the main drag, one finds rural modest homes of Island residents, cattle pasture, forest, and beaches. Everything exists because of the turquoise waters. Main Street sees a steady, diverse stream of pedestrians. Very few cars or trucks are on the island. Indeed, I count only two cars in 90 minutes of Main Street walking and sitting. The Aggressor steams back to the Honduran mainland first thing in the morning under a steady rain — rain that we were fortunate to avoid for our entire week of diving, and which can be safely ignored on this day of travel. We reach our dock and bid farewell. The group of divers boards the bus back to San Pedro airport and home. I taxi to the Jungle River Adventures office in downtown LaCieba. There, the sole English-speaking staff person I find instructs me to wait. After about 20 minutes, a tall, thin, stern-looking man points to me and in a Spanish accent says, “Jungle River?” “Si,” I respond, hoping this is the man I’m supposed to get a ride from to get to the fearsome Cangrejal River for my scheduled whitewater rafting trip. After stopping and waiting for several minutes at a number of different hotels without seeming to accomplish anything (like, say, picking up additional Jungle River customers), I find I’m growing increasingly disconcerted. Two Spanish-speaking males who do not speak a word of English are the only ones in the 4-wheel drive with me. Am I supposed to be in this vehicle? Where am I being taken? We drive through the stereotypically Third-World downtown of LaCeiba, which gradually becomes rural. We are now roughly bouncing up a gravel road puddle by the still-falling rain. To my right is what appears to be the Canjragel. I observe this with both relief and trepidation. Relieved because it now seems I am not being driven to some remote location to be shot. Worried because the river — which I will apparently soon be screaming down – is loaded with the largest (“mucho grande”) boulders I’ve ever seen. We arrive at the Jungle River lodge, perched above the roaring Cangrejal. After being given my helmet, paddle and preserver, we board the 4-wheel drive again and are taken upstream. We walk down a treacherously slick boulder path to the river. Even though it has been several hours since I’ve disembarked the liveaboard Aggressor, I still feel as if I am rocking back and forth to the wave action my brain had gotten used to over the past six continuous days at sea. At the river, we are given an astonishingly lengthy, thorough, 90-minute “safety training course” by our raft guide. It turns out to be the most enjoyable, exciting portion of the days’ experience. We are told we must swim across swift currents, jump into deep water and swim to and from river-side boulders, swim along a stone wall within an eddy, hike across river boulder fields, and demonstrate in-raft, man-overboard rescue skills. He points down to the fiercely boiling whitewater pool 20 feet below us at the base of the enormous granite boulder we stand on. He and I are to leap (to our deaths?) and swim to the rock wall across the storming, roaring whitewater boil (while the other three watch in horror, no doubt, but thankful they have not had the “honor” of being selected). The guide provides detailed, ghastly instructions about how I am to be obligated to rock climb the opposite sheer wall with my bare hands and feet. I am to alternate between stepping on his thighs and shoulders, and finding various and precarious footholds and handholds on the wall. I am secretly terrorized, but show outward calmness and confidence, as if it were not the case that I have never engaged in a rock climb of more than 5 feet (no matter how much “fun” he thinks it is). I comfort myself by thinking how I will simply back out by informing him that he had mistakenly thought I had rock-climbing experience and as a climbing virgin, surely he would understand my need to back out. But I realize it is too late. Everyone is watching and fully expecting me to show I am eager to experience “extreme fun.” Without flinching, he soars into the angry whitewater pool below and beckons me to follow. I’m committed. There is no turning back. I fly toward what will surely be my doom. I emerge from deep below and swim to the guide, who waits for me at the wall. There, he starts me on the impossible task — reminding me at each step and handhold what I am to accomplish with my next precarious reach. I start the climb — the wall is most steep, slippery and difficult as I emerge out of the whitewater. I pull myself up about eight feet by climbing over the guide and desperately cling to the surprisingly slick wall. I am then told to reach impossible lengths to my left with my hand and to my right with my foot, Spiderman-like. I grasp for the handhold above and exert all the energy in my body to hoist myself to the first ledge. But my sleep deprivation (suffering insomnia, I awoke at 1:30 am this morning) and drain of the dive week doesn’t let it happen. I am now standing (teetering?) on the guide’s shoulders, gasping for air without an ounce of energy. With the whitewater churning below me. The guide shouts, “YOU CAN DO IT!! !” Again, I have no choice. He gives me a slight nudge and I somehow manage to lift up to the first ledge. The remainder of the free-wall climb is less demanding, as he shows me the various handholds and footholds along the wall. Somehow, we make it to the summit. I am now 35 feet above the growling whitewater below. The guide provides strict instructions about how to correctly enter the water from this kind of height — straight in and feet-first, like a missile. No sitting position or leaning back. I hesitate to follow. I give a thumbs up to the three safely on the other side, and calmly jump. It seems like forever to reach the water. But after the wall climb, this is cake. I am assigned to the smaller and therefore more exhilarating two-person raft. It will be just me and a guide. The guide informs me that nearly all riders fall out on this river, even though the extreme rapids occur a few months earlier from October through December. I point out to him that the most fun I’ve had rafting in the past was when I fell out. We head down. The forest is loud with shrieking tropical birds. The trees above are, at the highest level, a cloud forest. Lower, it is a rainforest. Our relatively brief ride (anti-climatic after our alleged “training”) features some adrenalin-pumping Class III and IV rapids, and fairly deep, abrupt drops. Overall, a fantastic day of whitewater thrills. And a worthy finish to an adventurous week in Honduras.